I hope that their store at Ebbw Vale is better than their store at Aberdare, I live less than 400yds from it, which would be perfect for my tackle & bait needs, except for the fact that the stock held there is very limited & total rubbish. I have been told there is a bit of a difference between the two. I would definitely recommend getting over to Ebbw. Plenty of gear in there. In the mean time a new fishing blog post went online this afternoon. Surface fishing using the pole. Great sport, loads of fish. Was tiring but well worth it! 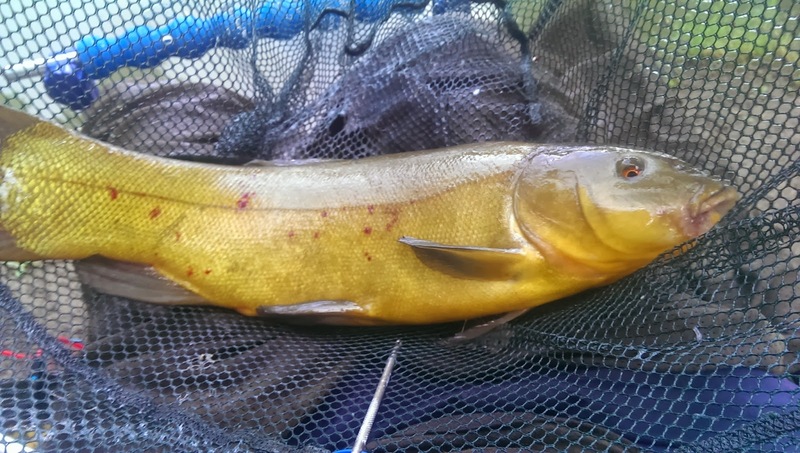 New fishing blog went online this afternoon. Catching Carp, off the surface. Great fun and quite exciting watching the little buggers before you set the hook. Morning all, as mentioned above I've visited a few tackle shops recently to see where I could get the best value for money. Found a belter in Cefn Mably, went fishing straight after too so will get that post up shortly. 2 new blogs have gone up recently. One about the Healthy River program currently being run by the Charity Groundwork on the River Sirhowy. The second one is a great tackle store I recently visited, and a definite must visit shop if you are in the area. Also if anyone knows what's up with this fish, I'd be happy to find out, if you could drop my a line on the contact form that would be tops! Morning all! Just posted some new blogs online. One involving a site visit to a local river (Sirhowy), flowing a recent clean up. The other, a trip to the river Wye. Ended up catching a PB Barbel. Great few hours.